Automatically-operated garage doors are so commonplace today that most of us think of them as a basic modern convenience. It is true that these electronic devices contribute greatly to our comfort, security and general quality of life. Nevertheless, like many mechanical conveniences, electronically-operated garage doors can be dangerous, particularly for children and physically-challenged people as well as for family pets. According to a report posted on Garage Door Child Safety.com, in 2007 alone, garage door accidents caused 13,325 injuries severe enough to require medical attention. Some accidents are caused by mechanical failure or incorrect installation or maintenance, but the majority can be prevented by employing basic safety precautions. 1. Make sure that you, and all other household adults (and older, responsible children), know where the door’s emergency release is and how to operate it. This is something to review regularly, just as you check smoke alarm batteries and brush up on other emergency plans with your family. Your garage door installer or maintenance service can demonstrate use of the emergency release, and your user’s manual should also provide instruction. Taking the time to do this can help immeasurably in an emergency when a person or pet is caught in any part of the door. 2. Prepare for the presence of children. Even if your household doesn’t include young children, you should be prepared for visitors, expected or otherwise. Make sure that the key pad mounted on your garage is placed high enough that small children can’t reach it. Don’t let children play with your garage door remote control. Emphasize to children that the doors must be handled with care and respect. Electronic door openers may seem amazing to a child, but they should know these are not playthings. In addition, take the time to show your children any places where fingers could be pinched in the door mechanism. Finger damage and even amputation are the most common garage door injuries for adults as well as children. Take particular care if your door is a style with segmented panels. 3. Do not stop your door’s motion when it is part-way open and leave it standing in that position. When the motion is activated again, the door may slam down on anything or anyone under it. 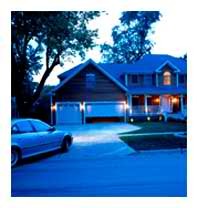 All garage door openers made since 1993 should be equipped with an automatic emergency reverse feature that activates if the door encounters an object in the pathway as it closes. Once a month check to make sure your emergency reverse is operational by placing an object such as an empty cardboard box or a pillow on the floor and closing the door on it. When the door touches the object, it should immediately reverse and open again. If it does not operate correctly, a reputable garage door repair person should be called promptly. If your door was made before this feature was mandatory and it doesn’t have it, please seriously consider replacing it with a modern model that is much safer. 4. Once a month you should take the time to check the moving parts of your door for visible wear or malfunction. Examine the rollers, pulleys, cables and springs. Any worn or displaced parts should be adjusted or replaced by a professional. In today’s busy world, electrically-operated garage doors are so commonplace that most of us think of them as a basic modern convenience. These up-to-date devices certainly do make our daily life more comfortable and convenient, but they also provide a much higher level of security against intruders than old-fashioned manual doors. Clearly protecting home and property is a high-priority for everyone, and there are measures that you can take to make your garage door even more secure. 1. Never leave your garage door opener’s remote control in your vehicle when you leave the vehicle. Don’t entrust a parking attendant or valet with your remote control either; this little convenient device is too important to handle carelessly. Think about it: If someone steals your remote or steals your vehicle with the remote in it, that criminal will also have stolen free access to your property. Just take the extra effort to take your remote with you when you leave your vehicle. A keychain remote control is convenient in this respect. Additionally, if your garage has an access door to your home, take the time to manually lock the house door when you leave, just in case someone does manage to get into the garage. 2. Many garage door openers operate with a “rolling-code” system that changes the code every time they are activated. This prevents criminals from deciphering and using your private code. If your model does not use this system, your remote and opener probably use a standard access code that was programmed by the manufacturer. You’ll want to change that code (check your owner’s manual), and then think about switching to a new model of garage door opener that does employ more up-to-date security technology. 3. Finally, if you are going to be away from home for days (or weeks) for a business trip, vacation or for any other reason, take the time to disconnect your garage door opener by simply unplugging it. This protects against any accidental or deliberate attempts to trigger your code and open the door. You may also consider investing in a vacation lock security switch which is available for many garage door opener models. Either way, you don’t want to leave your garage door vulnerable to crafty would-be intruders.